Monitor and transmit on FlexRay networks. Time sync with neoVI FIRE hardware. Develop FlexRay / Handler ECU code on the PC. Reconfigure FlexRay networks without using device programmers. 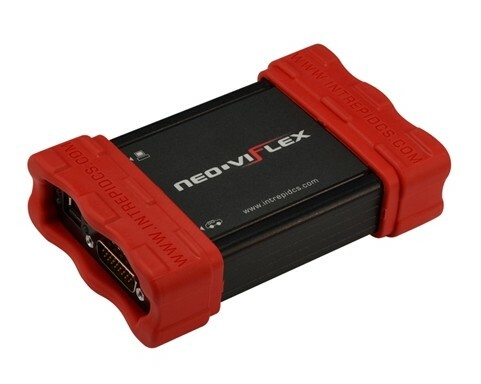 neoVI FLEX has a rugged metal enclosure with shock absorbing rubber molded boot. Easy to reference label with device pin out (see pictures above). Four TJA1082 FlexRay physical layer transceivers. USB powered – no other cables needed. Xilinx Spartan 3A FPGA connected to FlexRay signals for monitoring. USB 2.0 High Speed interface to the FlexRay board allow SPI configuration of FlexRay controllers, Transceivers, and FPGA. Windows software for configuration of the board includes a GUI application.